The Great Wall of China is a series of stone and earthen fortifications in northern China, built originally to protect the northern borders of the Chinese Empire against intrusions by various nomadic groups. Several walls have been built since the 5th century BC that are referred to collectively as the Great Wall, which has been rebuilt and maintained from the 5th century BC through the 16th century. 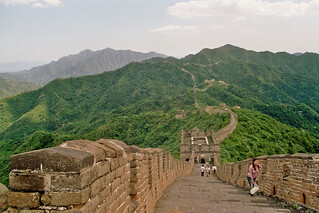 The Great Wall stretches from Shanhaiguan in the east, to Lop Lake in the west, along an arc that roughly delineates the southern edge of Inner Mongolia. The most comprehensive archaeological survey, using advanced technologies, has concluded that all the walls measure 8,851.8 km. This is made up of 6,259.6 km sections of actual wall, 359.7 km of trenches and 2,232.5 km of natural defensive barriers such as hills and rivers. Mutianyu is a section of the Great Wall of China located in Huairou County 70km north-east of Beijing. As one of the best-preserved parts of the Great Wall, the Mutianyu section of the Great Wall used to serve as the northern barrier defending the capital and the imperial tombs. First built in the mid-6th century during the Northern Qi, the Mutianyu Great Wall was rebuilt in 1569, and till today most parts of it are well preserved. Built mainly with granite, the wall is 7-8 metres high and the top is 4-5 metres wide.